HOW CAN WE DEFEAT UNCONVENTIONAL GAS EXPLOITATION IN WALES? Large areas of Wales are threatened by Unconventional Gas development, in the form of Fracking, Coal Bed Methane, and Underground Coal Gasification. All of these technologies have caused pollution, harm to human health & social and economic disruption in Australia & North America. This meeting is for any individual or group who is keen to act. 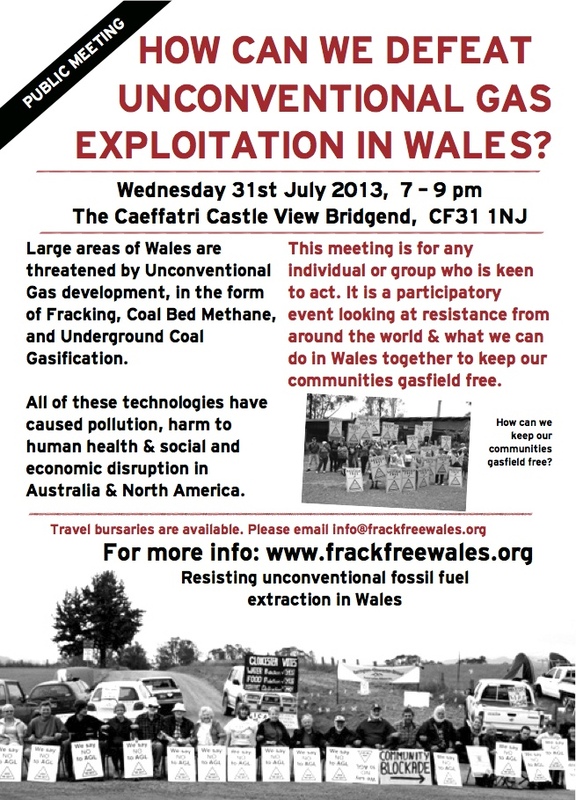 It is a participatory event looking at resistance from around the world & what we can do in Wales together to keep our communities gasfield free. This entry was posted in Uncategorized on July 28, 2013 by Bridgend's Green Leftie.